The sunny weather continues but while we’re all enjoying the heatwave, so too are the UK’s wasp population. We don't have anything against these pollinators and they're an important part of the ecosystem, but a wasps nest in your home or garden is bad news. Hot weather, warm evenings, picnics outside and al-fresco dining – the perfect conditions for one of the most annoying pests in the UK to thrive – the dreaded wasp. The current heatwave is perfect for the black and yellow insects as it provides better breeding conditions. As such you may be encountering more wasps than usual at the moment, particularly if you’re spending lots of time in your garden. 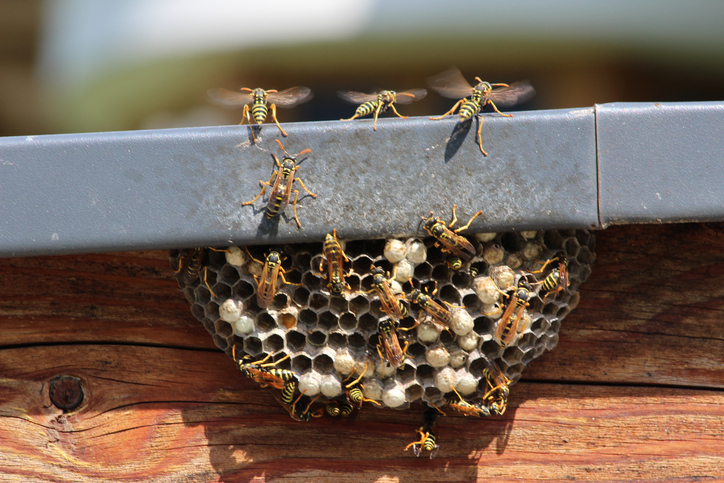 If you’re seeing considerable numbers of wasps in your home or garden, however, it could be that you have a nest. Wasp nests can be home to thousands of the creatures, and disrupting one can be very dangerous. Wasps are aggressive and can, and do, sting repeatedly. The quickest and most effective way of treating a wasps nest is to get someone in to deal with it. Try to get the nest removed as soon as you spot it, or spot lots of wasps returning to a particular spot in your brickwork or roof. One option is your local authority pest control. Prices will vary depending on where about in the country you are. In the North West you will pay around £62 for a single treatment, in South London you’ll be looking at between £80 and £105. Bear in mind, however, councils are likely to have a delay at this time of year so you may be waiting a while. If you don’t want to wait, look for flyers through the door and recommendations online and from neighbours. Ideally, the first you choose should give you a guarantee to come back for free if wasps return this summer. Private firms can charge anywhere from £35 to upwards of £100. You may choose to treat the next yourself. There are plenty of spray, foams, and powders available that can be used to kill the wasps. Apparently, one all-natural solution can be made using one part peppermint oil with four parts water. The solution is said to kill off eggs and larvae and be so unpleasant for wasps they’ll leave their nest for good. Needless to say, if you are allergic to wasp stings (known as a venom allergy) you should not be dealing with wasps nests! What about the nest itself? Leaving the nest where it is is an option but you must make sure all of the wasps have left. Once the nest is empty, if it has been treated professionally with insecticides, the poison will remain in the nest for months. That means if other wasps decide to raid the nest they too will succumb to the insecticides. This also means, however, that you should not touch the nest either. If you’ve used a natural solution and all of the wasps have left the nest it should be safe to touch. You can remove it quite easily and place in a bin bag. If a wasps nest is in your garden or hard to reach you could leave it there once treated. The papery material should break down. But be aware they can cause damage to your home if, for example, they are against wood or plasterboard and become damp, in which case, best to have them removed. not aggressive, and do not come in the house.I propose to leave them alone, they are part of nature’s gift..Too much irresponsible killing of insects which are mostly harmless.Do not encourage killing unless absolutely essential.